The importance of plane end-bearing surfaces in the preparation of concrete core specimens for compressive strength testing is demonstrated by means of physical tests. Incorrect measurement of the in situ strength of concrete by crushing extracted cores has serious economic and legal implications. Recent experience has shown an alarming spread of results when cores from a single structure were capped and tested by different laboratories using different procedures. In South Africa, the procedure for preparing and strength-testing cores is defined by SANS 5865 Concrete Tests - The drilling, preparation, and testing for compressive strength of cores taken from hardened concrete. This standard provides for two methods of preparing the load-bearing ends of the core specimens, namely the use of hot sulphur mortar and High Alumina Cement (HAC) mortar. The SANS 5865 method of preparation using sulphur mortar entails mixing equal parts of molten sulphur (at a temperature of approximately 240°C) and sand with 2% - 3% carbon black. This molten mixture is then cast onto both ends of the core specimen using a collar (often a piston ring compressor) and a precision-made rigid metal plate that is plane to within 0.5 mm/m with a slightly bevelled rim to create the required plane surface. The SANS 5865 method of preparation of end caps with HAC mortar is essentially the same, but a sheet of flat glass (of thickness at least 6 mm) is used (instead of metal) to form plane-bearing surfaces, since it does not need to withstand high temperatures. A number of laboratories have elected to cap core specimens with the HAC mortar instead of hot sulphur for stated health and safety reasons - including risks of burns, fire and inhalation of sulphur fumes. Observations of HAC mortar-capped specimens confirmed that the end-bearing surfaces were often out-of-plane (lumpy), evidenced by rocking when placed on a plane surface and/or forming gaps between the cast ends and a plane surface when tested with a feeler gauge. Specimens with convex end-bearing surfaces often split in half vertically during testing - analogous to a cylinder splitting test. Further investigation by Bugai confirmed that a reason for the departure from planeness was due to the fact that laboratory workers trowel the end surfaces instead of casting them against flat glass plates. Figure 1 shows typical "footprints" of cores capped with and without plane casting surfaces. Caps formed with a steel trowel tend to make contact against a flat bearing surface (such as a precision-ground steel plate or a plate of float glass) at only three contact points. 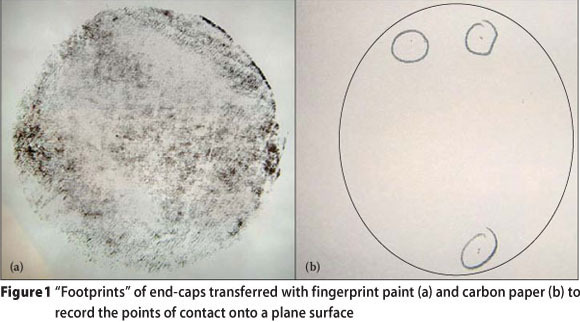 Two graphical techniques were found suitable to illustrate points of contact - transfer onto a plane surface using fingerprint paint, and transfer onto a plane surface using carbon paper and pressure. (Use of "engineers' marking blue" proved too viscous and rapid drying.) The sulphur-capped specimen (Figure 1a) exhibits even distribution of colour, confirming a large area of contact. The steel-trowelled HAC mortar surface (Figure 1b) exhibits three pinpoints of contact (ringed to highlight their positions). A second series of tests was then conceived to test the hypothesis that the low strengths of the HAC mortar-capped specimens were a consequence of their "lumpy" end-bearing surfaces. A single homogeneous batch of the same concrete mix was cast into a slab and used to make test cubes. Cores were drilled and extracted as before and divided between the same two laboratories. This time, the HAC mortar-capped specimens were prepared strictly in accordance with the method described by SANS 5865. The results are presented in Table 1. This time there was no significant difference in strength between the HAC mortar-capped cores and their sulphur-capped counterparts. One observation worth noting was the difficulty encountered when releasing the HAC mortar from the float glass. Despite the application of a generous quantity of release agent, the HAC mortar bonded very tightly to the glass. This observation might explain why laboratory workers have ignored the SANS 5865 requirement to cast HAC mortar against plane glass surfaces. 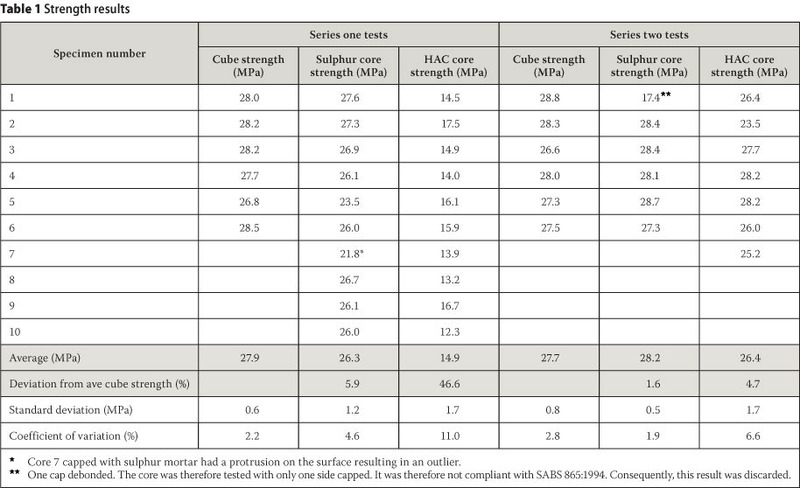 This investigation illustrates the need for proper preparation of core specimens to obtain accurate compressive strength results. The planeness of end-bearing caps has a significant influence on the measured compressive strength of concrete core specimens. The choice of capping material (sulphur mortar or HAC mortar) does not appear to have a significant effect on the results, as long as a standard procedure is followed to ensure that the end-bearing surfaces are plane. At least one commercial laboratory has changed its procedures as a result of this research initiative. Should low strengths result from core testing, it would be worth questioning the method of preparation and adherence to testing procedures. It is also prudent to specify that under-strength core carcasses (tested core specimens) should not be discarded, as these often provide clues as to whether proper procedures have been followed. TAL BUGAI is a graduate civil engineer from the University of Johannesburg. He is currently working for Powercall Investments, a property development company specialising in residential property development. This technical note is the fruit of Tal's undergraduate research project in partial fulfilment of the 'eguirements ofthe B.lng Engineering degree, for which he was awarded a distinction. DR RODERICK RANKINE, who is a member ofthe South African Institution of Civil Engineering (SAICE), is a registered professional engineer and concrete technologist specialising in the field of construction materials. His company, Rod Rankine Engineering Solutions cc conducts forensic investigations into failures, develops construction specifications and solutions to construction problems, and provides training to personnel who will be responsible for executing important work. Rod holds PhD and MSc degrees in Engineering, and a BSc Building degree, all from the University of the Witwatersrand. He also holds an Advanced Concrete Technology diploma.